Study of the past dynamics of the taxonomic diversity is a complicated job threatened by numerous traps and caveats connected mostly with improper or insufficiently representative material and inappropriate calculating methods (Dmitriev 2001). It is self-evident that the taxa used as operational units in the diversity calculation should be long living enough to have their duration at least roughly recordable in the fossil record available, and yet not too long living to display their appreciable turnover. The experience accumulated (Dmitriev & Zherikhin 1988, Rasnitsyn 1988b, 1989a, Jarzembowski & Ross 1993, 1996, Dmitriev et al. 1994a, b, 1995, Labandeira & Sepkoski 1993, Labandeira 1994, Jarzembowski & Ross 1996) confirms that the insect family satisfies best the above conditions at the present state of our knowledge. To select the appropriate calculation method of the diversity dynamics, a larger discussion is necessary. The first methods coming to mind is just to compare the number of taxa registered at the succeeding stages of the fossil record, for different stratigraphic intervals vary widely in completeness of their palaeontological study. Therefore, the number of taxa recorded at a time interval depends on both their past diversity, their taphonomic properties (chance to enter the fossil record [1.4]), and general state of knowledge of respective sections of the fossil record, and these different influences are hardly separable. In addition, the fossils are usually recorded after their stratigrafic position in a particular stratigraphic unit (period, epoch, etc. ), rather than by indication of their absolute age in thousand or million years. The stratigraphic units differ in their absolute time duration, so the longer unit is expectable to have the higher number of taxa, an effect deserving to be counterbalanced. The stratigraphic data vary widely in their level of detalisation: one taxon might be recorded just as the Cretaceous, while another as a particular zone within the Hauterivian, one of several stages of the Early Cretaceous. These sources of incertainty bear problems not easy to overcome. Further, handling with just the number of taxa recorded results in considerable loss of information comparing the separate use of the first and last appearance of taxa (substitute for their origin and extinction, respectively, the events hardly possible to be dated precisely). Indeed, the constant number of taxa recorded in two succeeding time intervals may be due to the absence of any change, or may be due to high but equal numbers of taxic origins and extinctions (equal taxic birth-death rates). Because of these and related problems discussed at length by Dmitriev (2001), a few relatively safe and informative methods have been selected. One of them is the momentary diversity on the boundary of two adjacent stratigraphic units which is calculated as the number of taxa crossing the boundary (recorded both above and below it). This permits to avoid or minimise the errors caused by the inequal duration of the stratigraphic units, as well as by irregular distribution of the exceptionally rich fossil sites that fill the fossil record with numerous short living taxa, a kind of noise in the diversity dynamics researches. Instantaneous diversity can be plotted against the time scale (Fig. 478a) to display directly the time dynamics of the taxonomic diversity. Otherwise it can be plotted against the total number of taxa appeared since the group origin till the moment considered (Fig. 478b). Advantage of this method is that the resulted chart, though ignoring durations of the stratigraphic units, displays separately both the gain and loss dynamics. 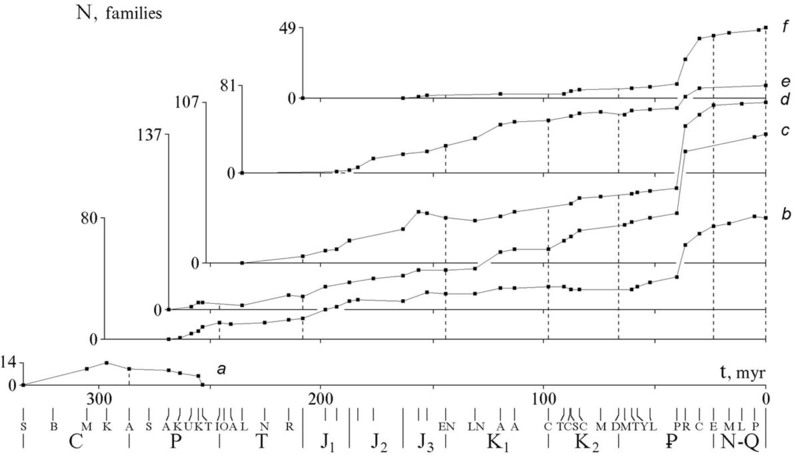 The line connecting the succeeding time moments shows the number of gains (first appearances of taxa) when measured along the abscissa, and the difference between the number of gains and losses (first and appearances of taxa) when measured against the ordinate. As a result, in case of pure losses the line will be directed straight downward, in case of pure gains - 45Вє oblique upward, in other cases - in intermediate direction. Other calculation methods used are numbers of gains and losses plotted separately against the time scale (Figs. 479a, b), and the share (per cent) of extinct families in the total insect assemblages (Fig. 480), otherwise known as inverted Lyellian curve (Zherikhin 1978, Rasnitsyn 1988b, 1989a). This method displace how a group approaches its contemporary taxonomic composition. The present calculations are based on the fossil record database in progress at the Arthropoda Laboratory, Palaeontological Institute, Russian Academy of Sciences. 1049 families are considered, less than 1261 referred to by Labandeira (1994): the extra 212 families are considered synonyms in our list. The stage is taken as the stratigraphic unit of the family duration. The families whose first/last appearance is dated less precisely are not ignored but interpolated in proportion of the precisely dated families. E.g. if an epoch consists of 3 stages with 10, 1, and 40 properly dated families, and 5 more families attributes simply to this epoch, the total distribution taken for calculation is 11, 1, 44. Fig. 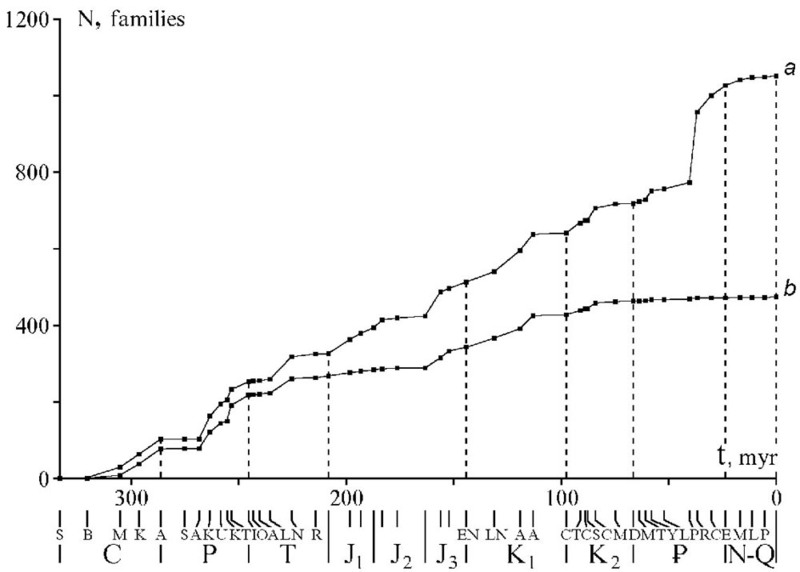 478 shows dynamics of the momentary number of the insect families calculated against the time (a) and cumulate number of the family appearances (b). Both curves have a rather simple form. The family number (a) is growing slowly in the Carboniferous - Triassic resulting in the subhorizontal pace of the curve. Since the Jurassic till the mid-Eocene the growth is more intensive but almost linear, although the norm of diversity accumulation (b) is not constant: it is higher in the Jurassic, becomes more slow near the Jurassic - Cretaceous boundary, and then grow again to reach 1 in the Cainozoic. The incomparably full record of the Baltic amber fossils gives a high step in the curve (a), then the growth decreases toward the present time, though it is still very high in the Oligocene. In contrast, the Cainozoic growth of (b) is linear. Fig. 479 gives further explanation of the above curves. 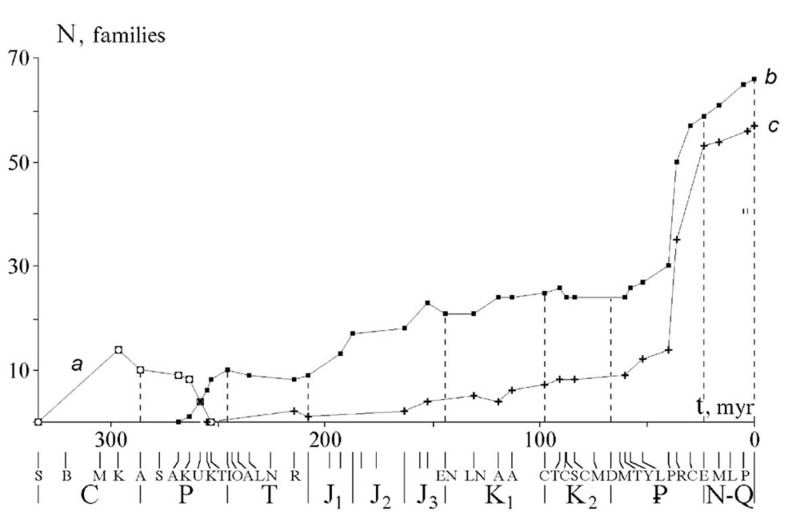 It displays number of the first (a) and last appearances (b) of families since the Serpukhovian Stage (latest Early Carboniferous). The angle of the curve inclination depends on the rate of the family origin and extinction, respectively. Long-term deviations in the rate are clearly displayed in the charts of this sort, but the short term tendencies are difficult to be correctly appreciated because of errors in identification of duration of the taxonomic and stratigraphic units involved. The curves in Fig. 479 are of simple form as well. Interesting is the near linear part of the first appearance curve from its beginning till the Middle Eocene. Unlike it, the last appearance curve is essentially convex throughout implying the largely decreasing extinction rates - up to near 0 in Cainozoic. Details of the two curves shed additional light to the curves on the Fig. 478. Low diversity in the Palaeozoic is connected with the extinction rates which are more distinctly high comparing the Mesozoic than the origination rates are. Lower diversity combined with the high tempo of origination and extinction means the high rate of the taxonomic turnover resulting in appearance of the numerous short-lived families: these are really characteristic of the Palaeozoic. 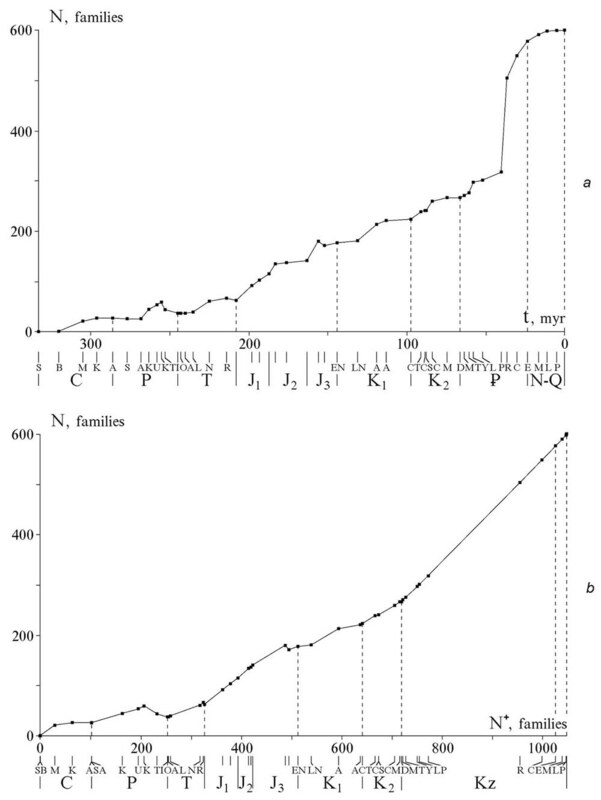 Since the Triassic, or maybe since the latest Permian, the origination and extinction rates appreciably decrease, and since near the beginning of the Triassic the curves of family number show the long-term Meso-Cainozoic growth starting. Though, toward the end of Triassic it has not surpassing the Permian value. The near linear growth of the family number with time (Fig. 478a), in the scale of the accumulated first appearances (Fig. 478b) breaks down into several characteristic parts. The curves (Fig. 479a, b) reveal structure the of this process. In the Early and Middle Jurassic, extinction rate decreases sharply, and family accumulation is therefore high, and the resulting diversity is growing somewhat more quickly than afterwards. Since the Late Jurassic till Aptian both the origination and, particularly, extinction rates keep high, so as the diversity accumulation is low. However, the curve 478a shows no peculiarities there. During the Late Cretaceous the accumulation norm gradually approaches 1 and remains so in the Cainozoic (Fig. 478b) because of the low extinction rate. The latter effect can be seeming because of the high knowledge of the living insect (Zherikhin 1978, Raup 1979), although this does not necessarily exclude really decreasing extinction rates. The Baltic amber insect record is exceptionally complete and can be even approaching to that of many contemporary regional faunas. It is separated from them by about 40 million years, and nevertheless very few Baltic amber families went extinct since that time. This implies the really low extinction rate after the Late Eocene. The cause can be the high genus per family ratio in the Cainozoic insects: many extant insect families do include more genera than those in other animal groups, but there is no evidence yet that similar difference exists between the Cainozoic and Palaeo- and Mesozoic insect families. From the other side, the massive insect diversification is often postulated to be connected with the leading position taken by angiosperm plants, and this event is really roughly coincides with the insect families acquiring their superstability. In the above general pattern of the insect diversification, one of the noteworthy trends is the Palaeozoic high rate diversification. Along with the minimum diversity near the Perm-Triassic boundary, it delimits the distinct Palaeozoic stage, as opposed to the Mesozoic one, of the insect taxonomic turnover. Similar are the basic pattern in other organisms: in marine animals as a whole and various their subgroup, in freshwater animals (Dmitriev et al. 1995), in non-marine tetrapods (Alekseev et al. 2001), non-marine plants (Benton 1993). Calling for the biological interpretation is the near-linear time path of the first appearance curve (Fig. 479a) since the Triassic till at least the Middle Eocene (in a coarser scale and with the Late Eocene step caused by the Baltic amber being mentally dropped, this sublinear interval would extend up to the present time). The origination rate varies around a near constant average value for 200 or maybe even more than 300 million years. 36 families entering the Triassic being compared to 306 entering the Late Eocene suggest more than the 8-fold diversity growth that has resulted in the near zero growth of the origin rate. So the latter is essentially independent of the diversity, and the per family rate is inversely proportional to the diversity. This invokes a diversity bonded mechanism of the divergence control, probably a kind of biocoenotic negative feedback. In case the divergence probability is independent of the biotic interactions (families evolve independently of each other), the momentary origination rate is proportional to diversity (to the number of families existed). If the biotic interactions exist, the momentary origination rate will grow overproportional to the diversification extent. The only case of the first appearance rate independent of diversity is probably the case of all families tightly interconnected to each other, so as the assemblage is evolving near as a whole. It is not to say that all the insects form a single evolutionary entity: same effect is expectable in case of several ecological entities existed which are tightly interconnected within themselves and loosely so inbetween. This pattern of the biocoenotic organisation appears appliable to the living communities. However, we are aware of no direct evidence of this kind of the biocoenotic organisation in the remote past. Biocoenotic stability is not absolute: it is affected by introduction, divergence and extinction events which may cause extrema in the curve. A similar effect may result from the delayed evolutionary reaction of taxa and their assemblages, which depends much on the flexibility of the biocoenotic structure. The subconstant origination rate of the insect families suggest that the flexibility is generally neither lost nor vary in too wide extent. Analysis of the extinction (last appearance) rate is less straightforward. Figure 479b demonstrates the decreasing extinction rate and, hence, its inversely superproportional dependence on the diversity. It is not clear if the above factors are involved here and how they might work. However, participation of the biocoenotic mechanisms does not look unlike as well. Interpretation of shorter intervals of the above curves suffers more from the incomplete knowledge than general features of the processes involved. Therefore only few more reliable inferences are given below. The Carboniferous. The first winged insects appear in the Serpukhovian Stage is Delitzschala bitterfeldensis Brauckmann et Schneider from E2 ammonoid zone of Arnsbergian [2.2.1.2.3.1]. The main diversification is the Bashkirian resulting in 20 families at its upper boundary. The growth continues in the Moscovian stage, though at the much lower rate, and the diversity stabilises in the Late Carboniferous. Features of the Moscovian - Late Carboniferous interval depend mostly on the steep growth of the extinction rate. Permian. Zero growth of diversity in the Asselian and Sakmarian is due to the very poor fossil record of this time interval. The norm of diversity accumulation (Fig. 478b) seems to be near constant since the Artinskian till the beginning of the Kazanian, while the origin and extinction rates appear decreasing and the diversification rate only slightly so. 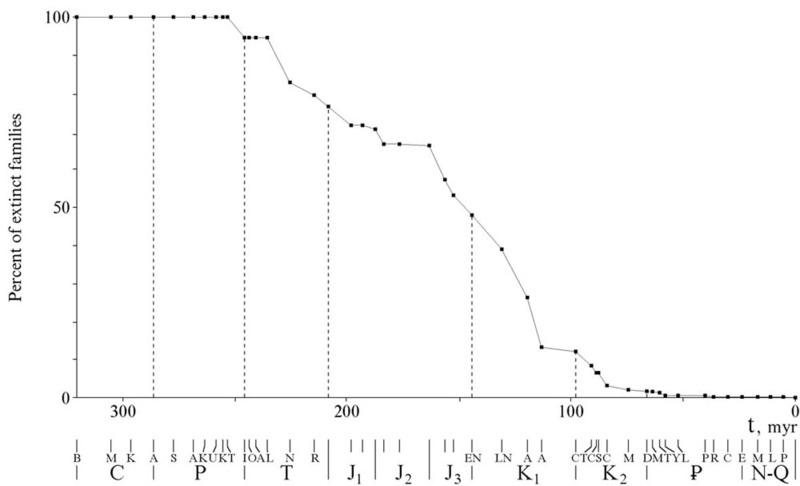 The Kazanian and Tatarian stages are characteristic of the quick apparent diversity decrease in the Kazanian and less sharp in the Tatarian. This might result from the comparatively modest Tatarian fossil record compared to the rich Kazanian one (Soyana in the Russian North). However, this pattern finds a parallel in the general Late Permian marine extinction that has its maximum before the latest Permian as well. The Permian/Triassic boundary minimum is the most pronounced (or, in a sense, the only well expressed) one in the origin accumulation curve (Fig. 478b). It is less expressed in the diversity curve (Fig. 478a) because of the long subhorizontal section before the Ladinian. The terminal Triassic and Late Jurassic minima are only weakly defined in comparison. Triassic interval is insufficiently known in respect of its diversity dynamics. Fig. 478b shows a massive accumulation of the first appearance in the Ladinian-Carnian, while the pre-Ladinian and post-Carnian sections are far reduced. This is because the majority of the Triassic insects come from the Madygen Formation in the Central Asia which is dated imprecisely as the Laninian or Carnian, the interval shown as a single unit in our charts. Poor record of the remaining Triassic, and particularly its pre-Ladinian section, might exaggerate the Permian/Triassic minimum though hardly creates it, because this minimum is observed in practically all palaeontological material. The very slight minimum can be seen at the Triassic/Jurassic boundary as well. This minimum is well expressed in majority of other groups (Alekseev et al. 2001). Together with the supposed coincide nce of the Permian/Triassic events, this might indicate that the insects obey to an extent the global synchronisation of the diversity dynamics. Jurassic. The low origin and extinction rates observed in the Middle Jurassic may be caused by the relatively poor records of that stage. Being followed by the very rich Karatau fossil site in Kazakhstan, this probably has caused the apparent steep rise of the curves in the beginning of Late Jurassic: the real pace can be more smooth. Nature of the subtle Late Jurassic minimum of the family number is unknown: its position is similar but not the same as that of the marine genera at the Jurassic/Cretaceous boundary. Early Cretaceous. Main insect assemblages here are the Early and Late Neocomian, Aptian and Albian. Before the Albian, the curves follow the general Jurassic direction (excepting the Middle and beginning of Late Jurassic diversions). In the Albian, all the rates of diversification and the first and last appearance distinctly decrease. The Albian minimum of diversity inferred earlier (Zherikhin 1978, Rasnitsyn 1988b, 1989a, Dmitriev & Zherikhin 1988) is not observed. Late Cretaceous and Cainozoic. This part of the curves show no noteworthy events, for the high Late Eocene step and the comparatively modest Santonian one reflect most probably the massive records from the Baltic and Yantardakh fossil resin collections, respectively. Unfortunately, the latest Cretaceous (Maastrichtian) record is too scanty to rule out any extinction simultaneous with that described for the marine, freshwater and terrestrial tetrapod assemblages at the Cretaceous/Cainozoic boundary (Alekseev et al. 2001). The process of the contemporary fauna formation is clearly displayed by the inverse Lyellian curve (Fig. 480). At the family level, the changes can be traced only since the Late Permian till beginning of the Cainozoic: the global faune consists of almost 90% living families as early as in the beginning of the Late Cretaceous and of more than 95% in the Santonian. The subhorizontal intervals in the beginning of the Triassic and Middle Jurassic reflect the poor record rather than the real stasis; the same may be true for the Albian (recent years the Aptian and earlier Late Cretaceous records were growing quickly unlike the Albian ones, so as the first and last appearances becomes more evenly distributed and not concentrated in the Albian, as before). The above generalised pucture can be completed with the observations on the diversity trends in some insect taxonomic and ecological assemblages. The taxonomic variations (Fig. 481) are exemplified by the dictyoneuridean orders (a), non-heteropteran hemipterans (b), beetles (c), dipterans (d), hymenopterans (e), and moths and butterflies (f). Of them, the ecologically most versatile beetles give the curve (Fig. 481c) most conform with the general insect pattern, with all the Permian/Triassic and Triassic-Jurassic diversity minima and the Albian plateau and with no distinct event on the Cretaceous/Cainozoic boundary. Similarly, the beetle diversity path is sublinear, except the Late Eocene step caused by the exceptional Baltic amber record, and the Early and Late Cretaceous deviations from linearity which are less pronounced but more difficult to explain. Another group demonstrating the diversity dynamics similar to that of insects in general are the hymenopterans (Fig. 481e). The order is represented by the only family before Jurassic so the diversity starts changing since that period. The decreasing diversification rate is appreciable between the Early and Late Cretaceous and a minimally expressed minimum at the Cretaceous/Cainozoic boundary. The higher diversification rate is registered toward the end of the Early Jurassic and at the Jurassic/Cretaceous boundary. The Late Eocene step is only moderately pronounced: probably the modern family level structure of the order has been formed well before the Baltic amber time. The homopteran and moth patterns differ more from the average. After their appearance in the Early Jurassic, the moths (Fig. 481f) long persist as rare fossils. They become only slightly more diverse in the Late Cretaceous when the angiosperm plants began their spectacular diversification, and the moth leaf mines appear not uncommon. However, the really quick growth of the moth and butterfly diversity starts only with the global thermal minimum and appearance of the open landscapes before the end of the Palaeogene. Unlike most other insects, at the end of Cainozoic the moth and butterfly diversification rate is still high and even higher than early in the Cainozoic. The homopterans (Fig. 481b) first appear as early as the beetles, in the mid Early Permian, but initially they diversify more intensively. They show no or only slight diversity loss when the general insect curve goes down. In contrast, homopterans show very slight minima in the Early Triassic and earlier and later Late Jurassic. Events near the Cretaceous/Cainozoic boundary are known insufficiently. The group is tightly connected ecologically with plants and deserves joint study. The most distinct pattern involves the Diptera (Fig. 481d). Like the hymenopterans, they first appear in the Triassic, albeit slightly earlier. Their diversity is growing ceaseless since that, particularly high in the Late Jurassic, and is followed by a prolonged event of the diminishing diversity toward the mid-Neocomian. This is followed with a slow but steady growth until the high Late Eocene step, and then, in the Oligocene, with an episode of the quickly increasing diversity. No generally appreciated crisis is found to affect the dipteran diversification rate. The dictyoneuridean diversification pattern (Fig. 481a) is limited to a part of the Late Palaeozoic (Serpukhovian through basal Kazanian) and thus incomparable with the above examples. It forms a simple curve with the single maximum before the end of Carboniferous. It can be concluded very preliminary that the general insect pattern may be better reproduced by the groups of the diverse ecology, while the ecologically more uniform taxa often display more specific patterns. The last case considered is comparison of the diversity trends in three ecologically distinct groups of the phytophagous insects (Fig. 482). These groups are the dyctyoneurideans sucking the liquid content of the gymnosperm ovules (a), the hemipterans sucking the plant vascular content (b), and the taxonomically diverse assemblage of the green mass consumers with the chewing (instead of sucking) mouthparts (c). The most interesting is their comparison with that of plants. Benton (1993) describes the plants diversifying very quickly during the Cretaceous. In contrast, the insect phytophags increase their diverity slowly. Possibly this is because the ecological role of the angiosperm plants is growing slowly during the Cretaceous in contrast to their diversity. In the Mesozoic the green mass consumers (c) are far less diverse comparing the vascular suckers (b), and this gap becomes much more narrow during the Cainozoic. This indicates that the Mesozoic rarity of the green mass feeders is probably a real feature of the insect evolution and not a mere taphonomic effect. This confirms the earlier suggestion (Zherikhin 1980a) that the major part of the plant history their green mass was weakly consumed by the insects.